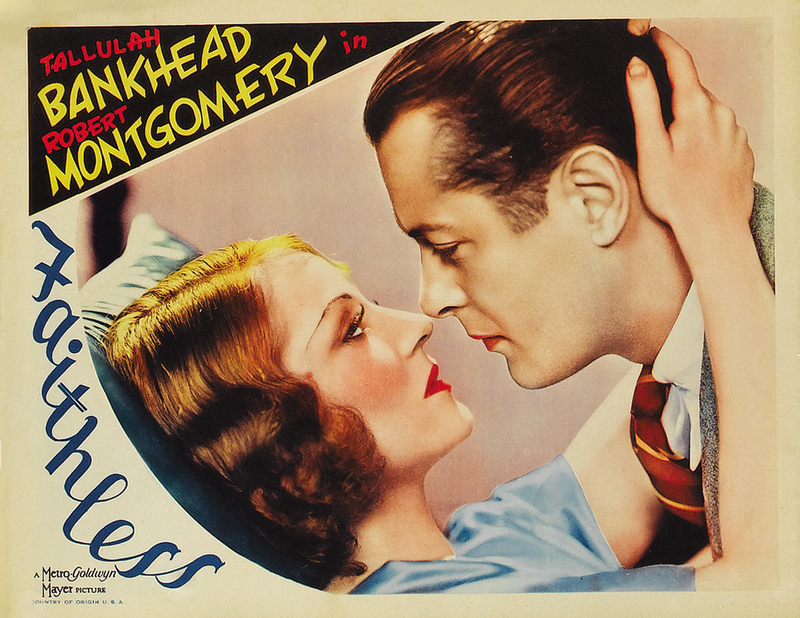 Faithless starring (and depicting) Robert Montgomery and Tallulah Bankhead. Despite what the poster may suggest, I would refrain from calling this a superbly romantic movie. It was a strange sort of story about a couple as the stock market crash comes about and their wealth disappears. When Montgomery’s Bill falls ill, Bankhead’s Carol finds she must prostitute herself to afford to keep him alive. It’s a story that sort of leaves one with mixed feelings. We had one successful guesser of the movie poster, Mr. Chandler Swain. I agree with one other guesser who mistook Tallulah for Joan Crawford. I don’t think the poster looks much like that unique-faced star of stage and screen, and it would be easy to assume it was Crawford given the handful of flicks she did with Montgomery. I want to say the woman is Joan Crawford and — just a wild guess 🙂 — the man must be Robert Montgomery… But what is the movie? It’s driving me crazy! That has to be Miss Tallulah Bankhead and Robert Montgomery in “Faithless”, if I’m not mistaken.